The Thistle Pairs competition was well supported by our club, with 18 of the 28 competitors being Orwell Ladies. The 14 teams taking part played three 5-end games (with three stones delivered per player per end) over three sessions. The competition was run on a Schenkel system. The runners-up, with two wins and a peel, were Eileen Thomas and Allison Pirie of Orwell Ladies. The winners were Anne Shaw and Lillian Carnegie from Forfar, who won all three of their matches. Congratulations to them. Many of the players commented on how much they enjoyed taking part in this event, which saw competitive but friendly curling combined with a chance to socialise off the ice. 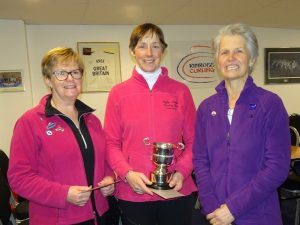 Postponed to 5 April 2019 from its normal season spot in February, the event was well organised by Kinross & District Ladies Branch, including our own Lizzie Glennie as KDLB Secretary. Many thanks. The Thistle Pairs was sponsored this year by the Kirklands Hotel, Kinross.